Russell and Kitty here. Coin Spot is a later carnival glass pattern that is often overlooked by collectors because it is readily available and reasonably priced. Trying to get the different base colors of glass of the Coin Spot pattern will take time. The stretch glass pieces of Coin Spot can be pricey. The Diamond Glass-Ware Company made the most of their Coin Spot molds! Many people think that it only comes in marigold and peach opal. Well we have news for you!!! First challenge is the name of Coin Spot. One auctioneer calls the pattern Coin Spot “Thumbprints” and others commonly call the pattern “Coin Dots” (Fenton pattern and very different from Coin Spot). If there hadn’t been pictures of the auction pieces, we would have thought that they were the Diamond Coin Dots! Fenton Coin Dot’s pattern according to David Doty’s Website and books lists the Fenton Coin Dot pattern in bowls, rose bowls and a plate, no compotes. Coin Spots pieces were in only small compotes as far as we know. 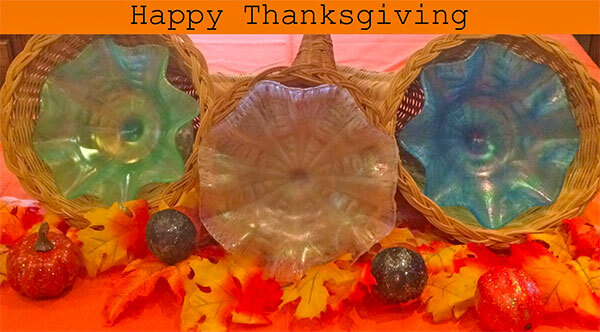 Most carnival glass collectors think that all of the Coin Spot compotes are found only in marigold and peach opalescent! Glass molds were (still are) very expensive. Both the marigold and the Peach opalescent are marigold iridescent sprayed (dope) onto clear glass. Just for fun, the Coin Spot pattern was used on pink and lime green glass with a marigold spray (dope) in the bowl. Diamond also had in their line an amber glass with a light marigold (dope) sprayed into the bowl. As well as a very deep amethyst which is totally opaque is called Egyptian Lustre with a colorful iridescence. The outside iridescence along the top is starting to separate (contract) like stretch glass, but this is due to the high heat of the annealing oven. Remember that the high heat temperature after the dope is sprayed onto the glass whether it is from putting the piece back into the ovens (Lehr) or from the annealing ovens makes the spray (dope) contract to make stretch glass. The previous pieces of Coin Spot were all carnival glass. David Doty on his website lists the following colors of the Coin Spot compotes listed above in carnival glass as well as aqua opal (rare), Vaseline (topaz), amethyst and a medium blue. 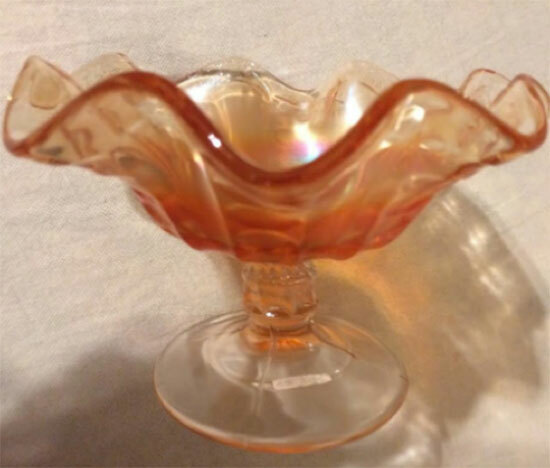 In the 1920’s when stretch glass was very popular, Diamond used the same mold to make their “Rainbow Lustres” in stretch glass. There is also a Twilight Wisteria comport in the Coin Dot pattern with terrific stretch finish, but we do not have a picture to show you. 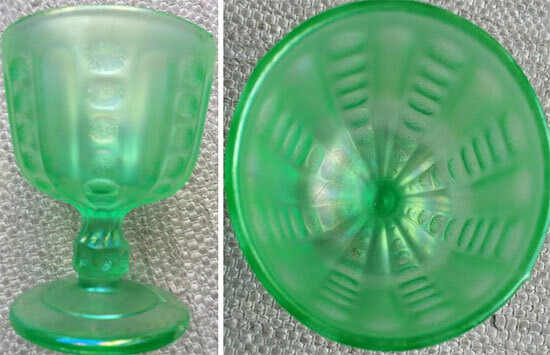 This is an Ice Green Lustre comport that is exactly how the shape came out of the mold without any work by the finisher. David Doty’s website lists a cobalt blue, blue and a celeste blue (Harding Blue). We have only seen the Harding Blue (celeste blue), cobalt blue and the Blue Crackle, so not sure what color the blue Coin Dot is that he is referring to. Because of poor quality control the plain blue may be a variation of the Harding Blue. The Coin Dot Compotes with a stretch finish can be quite pricey. The carnival and the stretch Coin Dot Compotes are a lot of fun to collect. 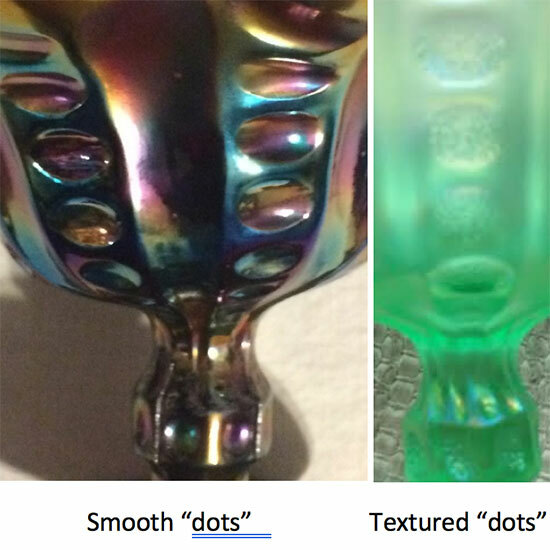 Some of the “dots” (including the “dots” on the stem) are smooth and others have a texture. So there must have been at least 2 different molds, but the price doesn’t reflect the different molds. Have only seen the textured “dots” on the stretch glass pieces so that probably was the later mold. The old catalogs are so much fun. Would love a “time machine” to go back and pay the prices listed in the catalogs! So if anyone has an extra “time machine” that works please contact us! 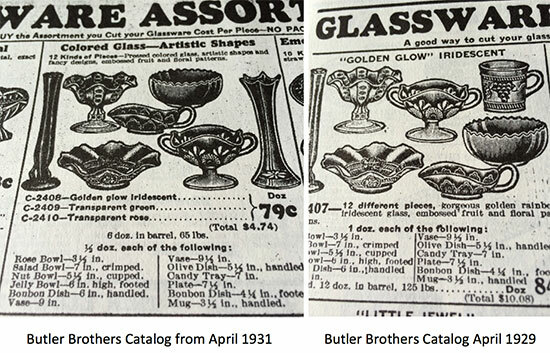 Did you notice the price for the April 1929 Butler Brothers catalog was $0.84 per dozen in the barrel; the 1931 catalog lists the price at $0.79 per dozen! They must have been very good selling compotes as there are quite a number of the compotes available in today’s market. But it can be challenging to find examples of each color of compotes.